MACH Nutmeg! 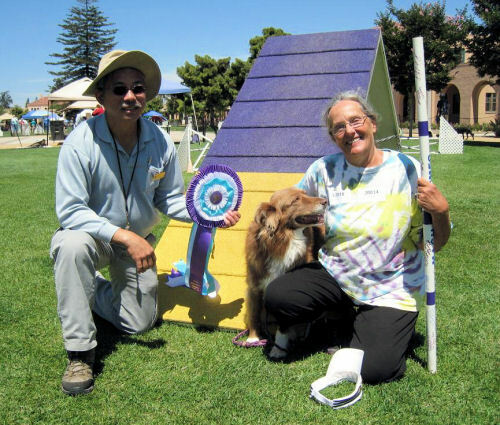 Although I started competing in AKC with Meg, it was certainly our nemesis for many years. Never the same thing, just one little thing every run - of course, that always gave us more to practice. Since we compete in several organizations, it would sometimes be a month or more between double Qs. And it felt like longer! On July 28, 2012, after Qing in Jumpers with Weaves (and earning a mere 6 points), we needed that day's Excellent B Standard run for our twentieth double Q AND our last 12 MACH points. And we managed to do both!! It was great fun finally to take that victory lap with my crazy little red aussie. We have both come a long way. Our last four double Qs came so fast, it was almost a suprise to find ourselves in the position to finish it off that Saturday. Earning the title on the first day we attempted to get the twentieth double Q was just the icing on the cake! 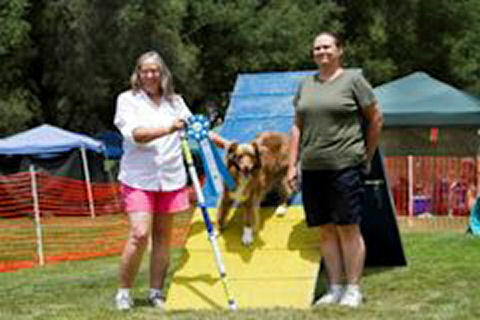 Meg earned her first major agility title on July 24, 2011 at the UDAC CPE trial held at Lake Wohlford Canine Ranch. She needed just one Standard run to complete her title that weekend, and she waited until Sunday to earn the qualifying run, so that she and Noni (and Kim D) could CATCH on the same day. Maria and Meg shown with Judge Lisa Potts.